On Saturday September 20th Isaac and I joined a group of a dozen or so volunteers to help shape and cut the new glade next to Red Devil at Saddleback Maine. 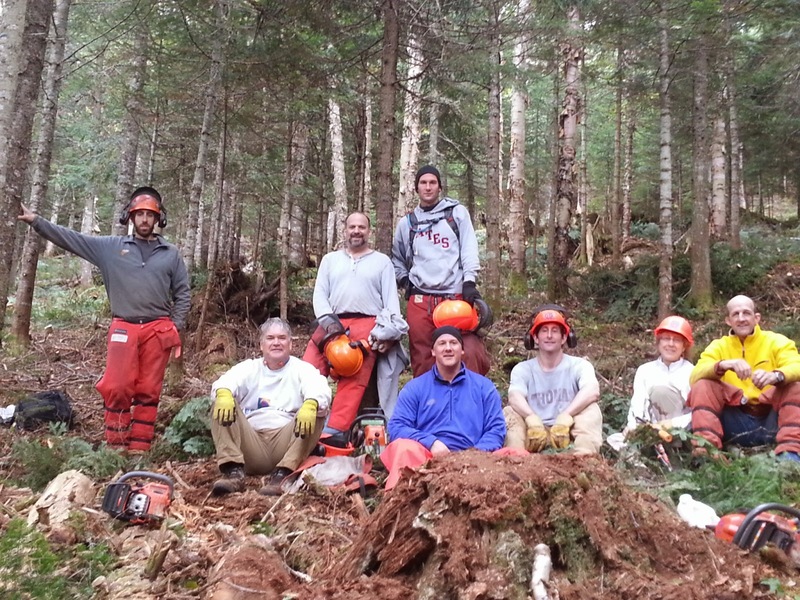 Jared Emerson - director of Saddleback's on-mountain operations - helped lead the effort. After a safety briefing from Jared, folks headed up into the woods to start work. The idea is that you basically pick an area you want to work in, and cut down the trees you think are necessary leaving the trees with enough spacing to get good turns in. After falling a tree, you limb it (and limb other trees standing) and lay everything as flat as possible on the forest floor. You don't want air pockets or places where you might get a ski stuck. Jared bounced around helping those that needed it but everyone did a great job. I have to say it is shaping up really well! Isaac and I spent a few hours 'cleaning up' behind the folks with the chain saws. We removed limbs from trees, and cut down a few smaller trees to make better turning areas. We spent most of our time working in a nice chute on the skiers right portion of the glade. Creating a glade is slow work and takes a lot of effort... but it will certainly be rewarding to ski! Thanks to everyone that came out to help. A little higher up the Chute. And even higher up the chute. Isaac is working on a jump. A main section of the Glade. Looks really good! Thank these folks when you ski the glade this winter!